Like a bar tab found stuffed in a pocket from the night before, The Traveler’s Delite was especially ugly in the morning light. We were so close to the freeway that I could taste diesel fumes. Snowdrifts covered the parking lot. Even the cocktail lounge that appeared to never close was a disappointment. Juice and coffee were not recognized as companions to alcohol and therefore not available anywhere on the premises. Had we stayed at my first choice, The Comfort Inn, we would have been swimming in a sea of caffeine and citrus pulp; but that ship had sailed when Margie decided that paying an extra $10 for clean air and potable liquids was not in our budget. The only good thing about our location was that we could see the freeway entrance from our motel window. It was finally the day we were scheduled to pick-up Margie’s Airstream trailer, “Sylvia.” All our bad motel experiences were about to be behind us. I was excited to see our new home and actually wanted to take the express route to upstate New York. But, in spite of spending the last three months focusing on keychains, Margie forgot to pack the one set we truly needed. No matter what time we arrived in Callicoon, NY, we would have to wait for FedEx to deliver the keys to Sylvia. Sit by a mailbox, or take our time to meander along some back roads; Margie looked like I had given her a choice between a firing squad and lethal injection. At least in the car, we would still be working. We took the back roads through the Pennsylvania Amish Country looking for restrooms that possessed a high tech gadget called a locked door. “Maybe we will find a skeleton key?” Seven words I never thought I’d utter outside a theme party. Margie wiggled in her seat and chewed extra fast on her licorice. “That would be the best.” For better or worse, we were in the same headspace. We pulled into an old service station and found electricity and motorcycle parts – two things I thought the Amish hated. In an area where people spent their time reading by candlelight and churning butter, the owner had chosen the unlikely career path of a motorcycle racer. I assumed that he would understand the need to leave the comfort and security of home in pursuit of a dream. Our journey was even too much for him to comprehend. Antique carburetors, old-fashioned doorknobs, and retro soda cans; those were interesting. But keychains? We might as well have stayed home and made quilts. It was enlightening to know that a mechanic in Pennsylvania could make me feel that I was making bad decisions and pursuing skewed dreams. That was a skill that I had previously assumed only my mother possessed. Our great country was unified in ways that I never dreamed were possible. 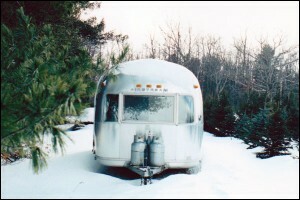 It was late afternoon when we reached up-state New York with the Airstream’s keys in hand. Standing on a frozen field behind the farmhouse that she once owned, Margie began to purr. We were staring at Sylvia. “Isn’t she the most beautiful thing you have ever seen?” I wasn’t sure where she was looking, but all I saw was a metal orb covered in snow. Never in my life had something looked so cold and uninviting. The warm homey trailer that I had been fantasizing about for ten days was frozen to the ground. I was scared to touch it lest my hands stick to the metal. Yes, Margie expected me to spend the next 20 nights sleeping in something that I was sure would cause freezer burn. I was beginning to get a vision of what it was like to visit Margie when she lived in Callicoon. After braving hours of New York traffic to get upstate, one would be greeted by Margie, who had just spent the entire week alone teaching herself the drums and practicing karaoke. After spending the evening listening to Margie sing “Bobbie McGee” and expelling five days worth of conversation, the guests would be pointed out into the darkness. If they survived the hike through the freezing meadow, the reward would be a long cold night inside of Sylvia shared with, I had to assume, at least one family of vermin. All my apprehension and worries about sleeping in the trailer might have been irrelevant. Sylvia was inaccessible. Before we could move her, we had to plow a path to the hitch. We needed a handy man with a plow, knowledge of the property and the desire to drop everything to help Margie. Enter Earl – another piece in the puzzle of Margie’s life in the country. Earl was a modern lumberjack who owned a Christmas tree farm. When they met, Margie was straight out of the dot-com industry. He had a quiet dignity and she could talk a fish out of the water. They became instant friends and spent their afternoons together deer watching and doing odd jobs around her house. The sweet admiration they shared for each other made me feel dirty and awkward. They greeted one another like two teenagers about to slow dance at a mixer. Margie told him what we needed and they climbed into his plow. I retreated to the warmth of the car and turned on the heat. Earl lowered the plow and nudged the untouched snow leading to Sylvia. He pulled back and re-entered the snow with a little more force. Every time he withdrew, he thrust into the bank with more power. The impact of every collision caused Margie to bounce around the cab of the plow. Windshield, window, dashboard, floor – it was shocking how much I enjoyed watching Margie ricochet from one surface to another. When the path was clear, we were finally able to access Sylvia and see her interior. Built in 1972 she was officially a classic. Neither Margie nor the owner before her, nor the owner before her, had thought to renovate the interior. Not one fiber of the carpet, benches or drapes had been replaced in thirty years. The stale moldy stench caused me to gag and my eyes began to water. Meanwhile Margie was inhaling and chewing the air like she had just stepped into a florists’ hothouse. After a pause of reverence, she reached into the first available cabinet, pulled out a sponge, and started cleaning. Suddenly I understood the relationship. 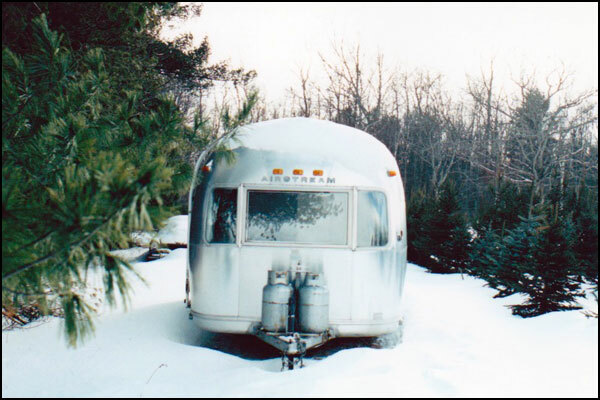 Sylvia was more than a guesthouse, more than a camper, more than an antique; she was a traveling OCD dream come true. Actually, they worked fine. It was the special brake used to compensate for the extra weight of the trailer that didn’t work. Smelly and cold no longer seemed so bad. Beyond all her other issues, Sylvia was a three-ton death trap hitched and double-strapped to the back of our car. With no running lights there was little chance of a rescue crew spotting us after the runaway weight of the trailer dragged us off a cliff ledge. We would never survive a three-hour drive in the darkness to New York City. We had to spend the night in Callicoon. I feared that my first night sleeping in the trailer was going to happen much sooner than I was prepared for. 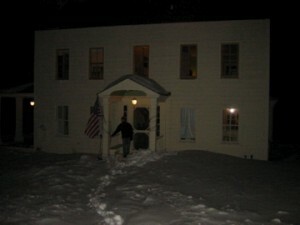 Luckily, with some scrambling, Margie was able to find us lodging for the night at a friend’s empty farmhouse. At the bottom of the snow-covered drive that swirled through the woods up to the house, we debated what to do with Sylvia. We could leave her along the road, empty the car and carry its contents – in the freezing cold – up the long road to the house. Or, we could take our chances, drive up to the house and gamble that there was a turn around at the top of the hill. The worst-case scenario with option one was hypothermia; with option two it was a tricky, nearly impossible driving maneuver with a trailer that had no brakes. At least in the car we had a fifty percent chance of survival. Slowly, we began the climb up the driveway. “It will be horrible if we have to back down this road,” accompanied every tire rotation, but we were slowly making our way to the top. Until, exactly halfway up the driveway, far enough up to make backing down a nightmare and yet still far enough from the house to make the hike there dangerous, we encountered a fallen tree that blocked the path and secured our fate. It was too cold to leave our equipment and food in the car. So, we had to carry it up to the house. Three round trips, as the sun set and the wind picked up. Each lap was colder and longer than the previous one. The final leg, shrouded in darkness and chipped by icy-snow, was physically painful. At the end, our reward was shelter in a beautiful century-old farmhouse. Everything but the heating system had been rebuilt and reconditioned. Thankfully there was firewood, lots of it. Of course I would have preferred to turn a thermostat and be immediately swallowed in a rush of hot air, instead, I hauled in a cord of wood to create a fireball that engulfed me in flames and immediately smoldered to ash. Yes, I could see exactly what it would be like to be married to her.